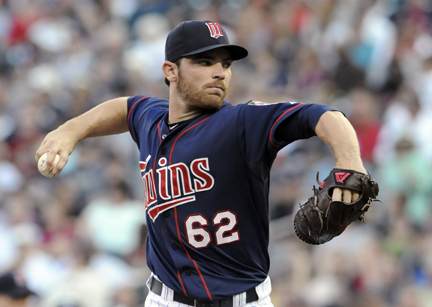 Ryan Doumit and the Twins on Friday agreed to a two-year, $7 million contract extension. This has been pretty well received in Twins land, perhaps less so elsewhere. Here's the case against re-upping him, as laid out by Hardball Talk's Matthew Pouliot, who makes some good points. I'm not strongly opposed to the deal, but I'm not expecting big things from him either. Pouliot is right in this respect: The Twins have a good niche for Doumit, who broke down physically as a regular catcher in his time with Pittsburgh. I'm not sure there's another player available who fits that niche quite so well, and that is reason to hang on to Doumit. One thing this usage pattern has meant is a job for a third catcher, since on most days either Doumit or Joe Mauer is the DH. Drew Butera is the mirror image of Doumit -- Butera a strong defensive catcher and a liability in the batter's box, Doumit a productive hitter (at least left-handed) and a poor receiver. These days, Butera catches when Francisco Liriano pitches, which (a) puts a strong receiver back there to deal with Frankie's wildness, something Doumit struggles with, and (b) protects Mauer from having to deal with multiple sliders in the dirt. It's the catching equivalent of being a tackling dummy. Why the deal now? I think the timing is related to the July trading season. 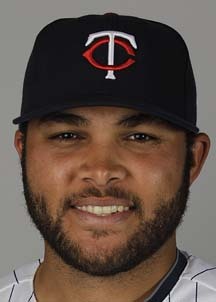 As matters stood, Doumit was a free agent-to-be, and the Twins might well have shopped him around . I assume there was a tacit understanding between the two camps: Sign and stay. There probably isn't a no-trade clause, but Doumit's now officially in the Twins plans for a while. Brian Duensing is the scheduled starter tonight; it will be his second turn in the rotation after spending the first two-and-a-half months in the bullpen. It seems clear that this is not intended to be a temporary gig for Duensing. Ron Gardenhire and Co. liked what they saw of him as a starter in 2009 and 2010, and the Twins are in sufficient need of competent starters that he's going to get a clear shot at the job he coughed up in 2011. There are a number of ramifications to this, not least of which is the need for a second lefty in the bullpen. Glen Perkins is either the closer or the eighth inning guy, and with him held back for the late innings and Duensing in the rotation, Gardy wants/needs a LOOGY to deal with left-handed sticks in earlier innings. Tyler Robertson is the first in line for the job. The hulking rookie — 6-5, 255 pounds, or so he's listed — had an auspicious debut Tuesday, striking out the first three men he faced: Alejandro De Aza (lefty), Kevin Youkilis (righty) and Adam Dunn (lefty). Robertson worked again Wednesday, and fanned De Aza again before allowed four straight singles. Two of them, however, where "swinging bunt" squibbers that Trevor Plouffe couldn't make plays on at third base, and another was a broken bat single. So the stat line after two outings is pretty ugly: 1.2 innings, four hits, two runs and an ERA of 10.80. More noteworthy, I think, are the four strikeouts. He's shown a quality slider, and having that breaking ball with which to torment left-handed hitters is half the battle in the LOOGY role. Two things must happen for Robertson to keep the job, only one of which is within his control. He has to pitch well, particularly against left-handed hitters; and Duensing has to get right-handers out consistently as a starter. If Duensing reverts to his 2011 struggles against righties, he won't stick in the rotation. Worse things happened in the Twins organization the past 24 hours or so than Wednesday's game, although that was plenty bad. 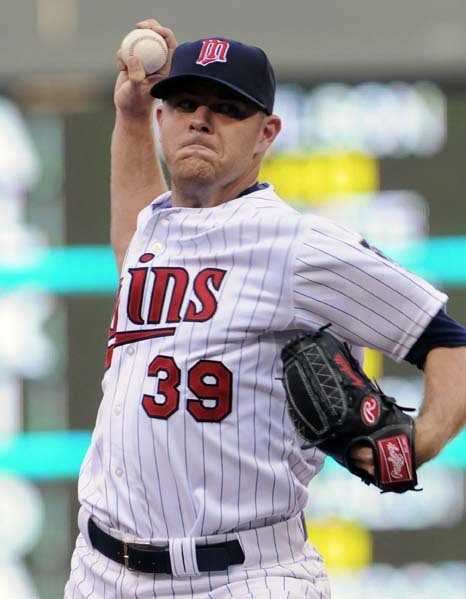 I refer to the death of Paul Bargas, the left-handed pitcher the Twins acquired from Colorado in exchange for Jose Morales after the 2010 season. Bargas never threw a pitch for the Minnesota organization; he was found during spring training 2011 to have a brain tumor. There was talk last winter that he was ready to try to play again, but ... it didn't happen. He was 23. Jeff Manship pitched one inning Wednesday, giving up three runs. This pushed his ERA up to 10.27, and the Twins optioned him back to Rochester and called up Kyle Waldrop. I thought Waldrop was likely to make the team during spring training, but he strained his right elbow in the final week or so and spent quite a while on the disabled list. He had a 1.29 ERA in Rochester (14.3 innings) since returning, but that comes with suspect walk and strikeout rates (five walks, five K's). 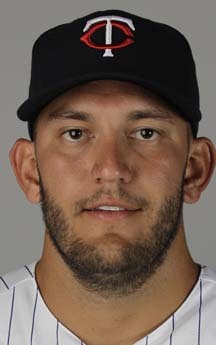 Leading up to Wednesday's nooner, Cory Provus, after talking about White Sox starter Chris Sale, told us that Twins starter Nick Blackburn "is also throwing the ball well." Provus has been a sizable upgrade on John Gordon. But talking up Blackburn's season just erodes credibility. Liam Hendriks allowed three runs in 6.1 innings Tuesday. Liam Hendriks took the mound Tuesday evening working a wad of chewing gum. It appeared to work as well for the Aussie as it has for Francisco Liriano; while Hendriks lost again, he pitched well (92 pitches, 61 strikes, first strikes to 15 of the 25 batters). FSN made it sound during the pregame that Hendriks was pitching for his rotation job. If so, it suggests some misplaced priorities in the organization, that people are taking the "we're only 7.5 games out of first" thing too seriously. Yeah, the Twins entered Tuesday's game 7.5 games out of first. They also entered it with the second-worst record in the American League. And they exited Tuesday 8.5 out of first, and with the worst record in the American League. Making decisions on the basis that this is a contending team strikes me as a bit foolish. Priority One should be: Identify, develop and protect the pieces of a future contending rotation. Hendriks, for all his struggles in the majors this season — and he has indeed struggled — is more likely to be such a piece than anybody they can replace him with right now. His numbers in Rochester (5-0 in seven starts, 1.94 ERA, 42 strikeouts in 46 innings) suggest that hitters in the International League have nothing to teach him. Hendriks' growing pains may be frustrating for Ron Gardenhire and Co., but they're for the best in the long run. run in seven innings Monday against the White Sox. 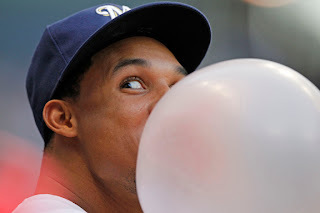 Maybe it's the gum Francisco Liriano is now chewing on the mound. Maybe it's simply the fact that he's too talented a pitcher, when healthy, to pitch as poorly as he did in his first six starts. But Liriano is now pitching at a high level once again. And on Monday, it was against a pretty good lineup. 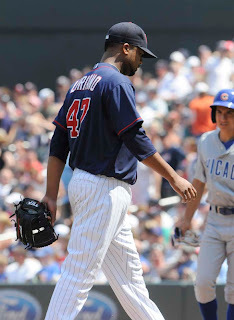 In his first six starts of 2012, Liriano had an ERA of 9.45. He has had six starts since serving a stint in the bullpen, with an ERA of 2.41. The first five starts came against teams that have struggled offensively. The White Sox have some serious punch in the middle of its order. It has some hitters who can drag out at-bats and punish a pitcher who lacks command. Games like this have to make it tempting for the Twins to resist the urge to trade the free-agent-to-be before the non-waiver deadline at the end of next month. 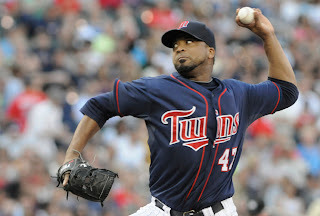 Certainly it should increase the interest of other teams in trading for Liriano. I do not expect the Twins to pass up a good deal for him. And games like Monday make it all the more likely that there will be a good deal available in the next five weeks. Unlike 2011, the Twins bullpen this year has been effective and, as a result, stable. Other than swapping out Matt Maloney for Jeff Manship as a mop-up/long man -- the least important role in the 'pen -- the relief corps has remained essentially the same. This is no longer true. Brian Duensing has been moved to the starting rotation, and Matt Capps is headed to the disabled list, with Tyler Robertson called up. Capps will never be loved by the fan base, but he is a competent closer, and his presence allowed the trio of Glen Perkins, Jared Burton and Duensing to fill up the seventh and eighth innings with outs. Now it all gets shaken up. Capps is out of the picture for at least two weeks, and Robertson gets a trial as a LOOGY (Left-handed One Out GuY). Burton got the save Sunday, but I think that was because Perkins was then the only lefty in the bullpen, and manager Ron Gardenhire wanted to save him in case he needed somebody to match up against Joey Votto and Jay Bruce, Cincinnati's left-handed power. Gardenhire likes set roles. Robertson provides a second southpaw. I think Perkins is the ninth-inning guy for now. with four holds in 2012. Other than Robertson and Perkins, the big promotion here would be Burnett. He's appeared in 29 games, 36 innings, with an ERA of exactly 2.00. He hasn't given up a run since May 23rd; he's allowed just two hits this month (7.2 IP). That ERA overstates his effectiveness; his strikeout rate is just 3.8 per nine innings. At least one of those numbers -- the ERA or the strikeout rate -- is going to get higher. He's gotten outs, so his role is increasing, but it's difficult to sustain the outs with such a low K rate. 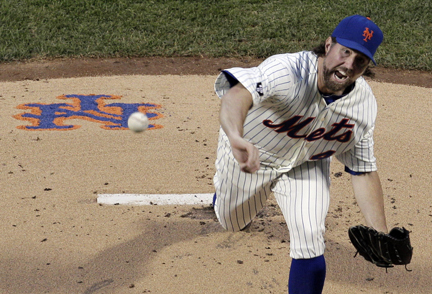 R.A. Dickey struggled Sunday against the Yankees. Sabermetric types tend to be fascinated by knuckleballers, such as R.A. Dickey -- perhaps because the athletic skill involved in the pitch appears slight enough for us to imagine that we could be doing this. But there are other reasons more tied to sabermetrics. Knuckleballers tend to break the mold of the statistics. The rules of thumb -- about strikeout rates, about batting average on balls in play -- that can be applied when evaluating pitchers through the stats generally don't apply to these guys. Most obvious: Unlike most players (pitchers or position players), they usually reach their peak in their 30s. Dickey, for example, is a full decade past the age at which players are most likely to have their best season. Which makes it impractical for an organization to try to develop knuckleball specialists. The rules covering player contracts and team control of those contracts have molded themselves around the "normal" development of talent. Typically, when a marginal player reaches his mid 20s, the rules will either push him up to the major leagues or out of the organization. And typically, knuckleballers are (a) marginal pitchers -- nobody with an adequate fastball takes up the flutterball; and (b) not ready at age 25 or 27 to pitch in the major leagues. And so, as I described in the Monday print column, Dickey bounced around -- Texas, Milwaukee, Seattle, Minnesota -- before finally emerging. It wasn't that the other organizations didn't give him a chance; it was that he hadn't yet mastered what he needed to have mastered. As for why most knuckleball specialists arrive late: I suspect emotional stability is a big factor. Most athletes are aggressive people. They're not given to letting things happen; their preference is to force the action. One of the constant struggles for most players is to learn to "stay within themselves," to NOT always push the action. That's even more true for knuckleball practitioners. Throw the pitch too hard, and it's going to spin, and if it spins, it won't do anything but get hit. Hard. So the knuckleballer must develop a certain passivity, or at least a resignation to his fate. He is dependent upon a pitch he cannot command in the same way a conventional pitcher can command his stuff. The knuckleballer throws his pitch and hopes it does something. Dickey has suggested that his current dominance is connected to his public disclosure of his sexual abuse and other demons. Purging his secrets in his memoirs leaves him with nothing to hide. Nothing that happens on the field can shame him. He is free to fail -- and free to succeed. 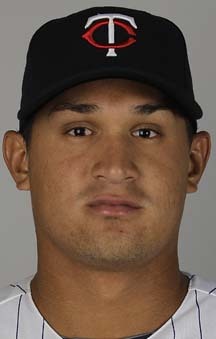 Carlos Gomez. He may still be missing the key to his toolbox, he may still be a source of frustration to managers and fans, but he certainly appears to enjoy his life. 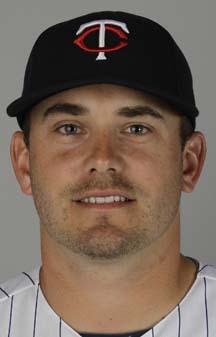 Brian Duensing is to start today for the Twins. He will be the 10th pitcher to start a game for Minnesota, and that's not counting Scott Baker, who didn't make it out of spring training. Duensing, of course, has twice before opened the season in the bullpen for the Twins and finished the year in the rotation. When he opened 2011 in the rotation, he had a terrible time retiring right-handed hitters, which is why he lost his starting job. The platoon differential has not been an issue this year for Duensing; while he's been devastating against lefties out of the bullpen this season, he's held right-handers to a .645 OPS. They've gotten singles off him, but just four extra-base hits, all doubles. On the other hand, it's not like the Twins have been getting such strong starting pitching that they would, or should, be quick to dismiss a good outing from Duensing. Much of his good relief work has been wasted this season because the starters have so consistently put the team in a big hole early. A decent starter is more valuable than a good reliever. Still: Moving Duensing out of the bullpen permanently would leave the Twins with one left-handed reliever, Glen Perkins, and he's not going to be used as a LOOGY. I don't see a lefty reliever in the upper minors who deserves a shot at the job. It's not the best reason to keep Duensing in the bullpen, but it's probably going to be a factor. Earlier this week, I posted about what the metrics tell us about Ben Revere as a right fielder. There is no shortage of fans who believe that Revere ought to be the Twins center fielder, with Denard Span playing right field. Ron Gardenhire is obviously not among that crowd. What about Span as a center fielder? Span is +13 in plus-minus, +9 in runs saved. Texas: Craig Gentry, who has about half the Rangers' innings, is +13, +9. Anaheim: Mike Trout, with less than half the Angels' innings, is +18, +10 -- and Peter Bourjos, who has 32 more innings in center than Trout and a little more than half of Span's time, is +9, +6. Toronto: Colby Rasmus is +11, +7. He's a bit shy of Span's numbers, and the only full-time center fielder in his class. Trout was called up last month and is only leaving the Angels lineup if he gets crippled. I figure Gentry isn't a regular because his bat is perceived as a bit weak, although you can't really prove it by his limited major league playing time (334 career plate appearances, career slash line .285/.355/.356, with most of that production coming this season). Span is a contender for best defensive CF in the league. Revere probably would be too if he were a full-time center fielder. But the Anaheim duo, at least by these measurements, is better still. At any rate, I don't think the Twins are hurting themselves with the Span-in-center, Revere-in-right alignment. Mark Dolenc, who played his college ball at Minnesota State and was drafted by the Twins in the 15th round in 2006, was released this week. He was in his third season at Double A New Britain, was hitting a mere .168/.203/.204, and had struck out 40 times in 120 plate appearances. At age 27, he simply was no longer even a marginal prospect. He was released to make room on the roster for Oswaldo Arcia, who was moved up from High A Fort Myers having hit .307/.376/.517 in a difficult hitting environment. Arcia just turned 21 last month, but he's already on the 40-man roster, a status Dolenc never achieved, having made his debut in the Twins system at age 17.
his risue up the ladder. It's an interesting collection of outfielders on the New Britain roster at the moment. On their way up are Arcia, who is clearly a good prospect and Aaron Hicks, their first-round pick from 2008, who has not developed as rapidly as hoped but still regarded as a good prospect. And there are Joe Benson (on the disabled list) and Rene Tosoni, each of whom got some major league time last year, each of whom opened the season at Triple A and got demoted to Double A after hitting under .200 at Rochester, each of whom has had injury problems. And there's Evan Bigley, who is ... not as touted as any of the other four. 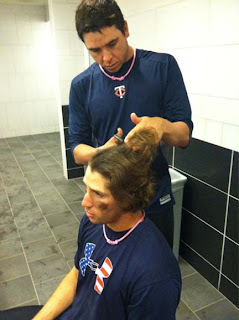 The Twins are noted for their patience with prospects, so I hardly expect them to pull the plug on Benson and Tosoni. But the two outfielders clearly have not enhanced their status this season, and Arcia certainly has. In my morning post today I predicted that the Twins would sign supplemental round pick Luke Bard. Tonight, the Twins announced that they had done so. Bard was part of an intriguing approach taken by the Twins in this draft: In search of power arms, they loaded up with hard-throwing collegiate relievers, with the stated intent of converting many, if not all, to starters. Bard might be the best bet of the collegians to make it as a starter. According to Baseball America's draft database, the Twins have signed nine of the 13 players they selected in the first 10 rounds. One of the unsigned, RHP D.J. 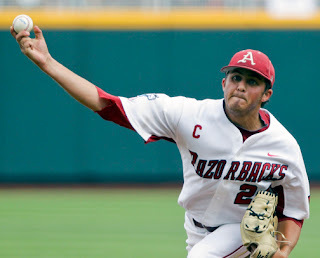 Baxendale (10th round), is pitching for Arkansas in the College World Series, so that he's unsigned is to be expected. 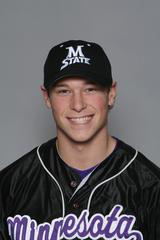 The most prominent of the unsigned players is RHP Luke Bard (supplemental pick). Bard is slotted for $1.227 million, and he may be angling for something more than that (the Twins are, according to Baseball America, more than $200,000 under their bonus cap so far). Bard's leverage is that as a college junior he could return to school and hope to be drafted higher next year. The Twins' leverage is that he doesn't sign, this pick is "protected," meaning that the Twins would get the 43rd pick in next year's draft. I expect Bard will sign. The Twins have inked 19 of their 40 draftees. 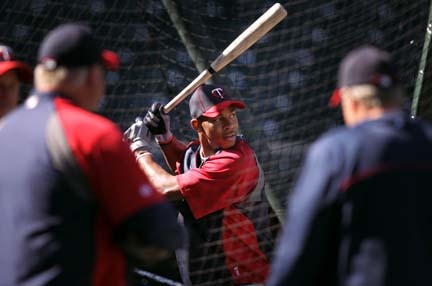 Byron Buxton, the Twins first-rounder (No. 2 overall) was Baseball America's high school player of the year. Their story on him is here. David A. Dorsey of the Fort Myers News-Press profiles Buxton here. 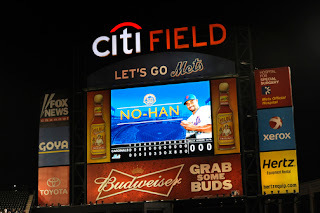 I took note the other day of Johan Santana's struggles in his first two starts after his no-hitter, so I should take note of his outing Tuesday against Baltimore: Six shutout innings, then an exit with 101 pitches. A good sign. Scott Diamond spluttered a bit again Tuesday against Pittsburgh -- 5.1 innings, four runs, eight hits, just one strikeout, and command issues. He had nine GB outs and six FB outs, which isn't as strong a groundball rate as he has usually had. I don't think his magic is gone, but I have to say I expected better against the Pirates. 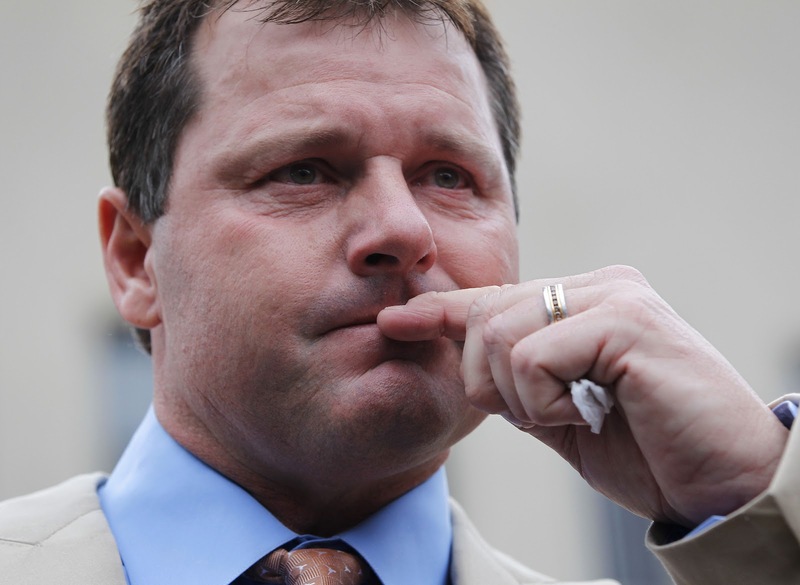 Roger Clemens faces the media after Monday's verdict. I am not a member of The Free Press editorial board. I once was, but that was many years and several publishers ago. But on occasion the bosses ask me to contribute. And being an opinionated cuss, I generally oblige. The editorials themselves -- unsigned opinion pieces -- are supposed to reflect the thinking of the editorial board, not merely that of one member, so it's not unheard of for my offerings to be rejected, revised or reversed. Which is fine; it's not my name on the thing. All this is preamble to what follows: my draft of an editorial on the Roger Clemens verdict. The editorial is to run in today's Free Press. I didn't work Tuesday, so I don't know how much, if at all, it was revised. What's here is my opinion; what appears on the Opinions page may be the same as this, or it may be different. Either way, there's no plagiarism involved. As a pitcher of baseballs, Roger Clemens had few if any peers; as a citizen, he has many. A federal jury of those peers on Monday decided against convicting the seven-time Cy Young Award winner of perjury for telling a congressional committee that he had never used performance-enhancing drugs. Then we have the multi-year, multi-nation, cross-continent investigation into bicycling legend Lance Armstrong, which was concluded recently without charges. These outcomes do not speak well of the time, effort, talent and resources the Department of Justice has poured over the past decade into the legal prosecution, or persecution, of athletes suspected of using PEDs. 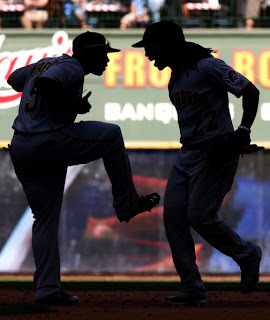 Bonds and Clemens were established superstars beginning the inevitable decline of age when they suddenly experienced new heights of accomplishment in their late 30s. Both insisted that it was their work and skills that revitalized their careers. Not everybody believed them, in part because the widespread use of PEDs throughout baseball was an open secret in the late 1990s and early 2000s. It seems noteworthy that neither Bonds nor Clemens was actually charged with using performance-enhancers. They were instead charged with lying about it. This begs the question: If using steroids (or human growth hormone, or EPO, or any other substance the athlete turns to to get bigger-stronger-faster) is so vile an act that it serves the public interest to spend literally millions of dollars taking the athlete to court, why not charge him with the actual act? And if the actual act is not a crime, or too insignificant to justify prosecuting, then why go after the athlete for denying it? The courts are meant to deal with legal violations, not ethical ones. It would behoove prosecutors to remember that. Ben Revere made three notable plays in the field Sunday, including one of his "how-did-he-outrun-that-ball" efforts on the warning track. Defense -- specifically range -- is a major part of his value to the team. This is true even in right field, the outfield spot at which Revere's subpar throwing arm is most noticable. Still, having two legit center fielders out there is a plus for the pitching staff, and I thought it worthwhile to take an early read on Revere's defensive metrics in right field. 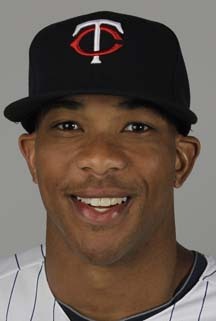 Emphasis on early: Revere didn't open the season in the lineup and spent some time in the minors before being recalled. He has 218 innings in right field; that's less than half the innings of the season. Still, by Baseball Info Systems' plus-minus and runs saved metrics, Revere's raw numbers compare quite well to even the best of the American League's full-time right fielders. Revere, as of the figures I consulted online Monday, is +8 in plus-minus, +3 in runs saved. These are good figures, especially considering the limited innings, but neither is close to leading the AL's right fielders. Ichiro Suzuki of Seattle, who has played 595 innings, is +15 and +13. Tampa Bay's Ben Zobrist, who has just 329 innings in right (he plays multiple positions), is +11, +8. Worth noting: Trevor Plouffe and Darin Mastroanni have a combined 187 innings in right field (less than Revere), and they are a combined +5 and +3. Ryan Doumit, meanwhile, is -4, -2 in 49 innings, which I'm sure didn't escape Ron Gardenhire's attention. Doumit hasn't played right field since May 4. 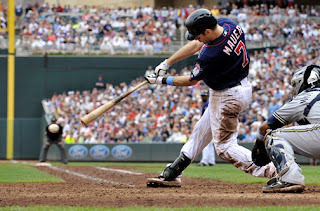 Joe Mauer had three hits and two RBIs Sunday. There are times when players wish they could just play the games without the annoying fans and reporters. This is, of course, a silly notion, but there are times when I understand. One such was Sunday, when Joe Mauer, catching with a wonky hamstring and a bruised quad, got booed by the Target Field fans for holding at first on a ball he hit to the wall. He got ripped last year for not playing when hurt. He gets booed for playing when hurt. A rough homestand ended on a positive note Sunday, but not before a four-game losing streak. One positive to the losing streak: The "m" logo caps returned to the shelf after the first three losses. The "TC" caps are back. Jeff Gray didn't get the decision in Sunday's win, but in many ways he was the hero for the Twins. The beleaguered reliever threw three shutout innings as the game dragged on. Gray's grip on his roster spot has been growing shaky of late. On May 19 his ERA was 2.00; then he had a no-outs, five-runs disaster, and his ERA hasn't been south of 4.15 since. He came into Sunday's game having allowed six runs in his four outings in June. But on Sunday, with Matt Capps sidelined with a sore shoulder and with Jeff Manship and Anthony Swarzak theoretically unavailable due to long stints in recent days, Gray threw 54 pitches and lowered his ERA from 5.13 to 4.60. "Bark in the Park" game Tuesday night. hoping someone will bring food. I have always used an Associated Press photo here, but I liked this one, made by my talented wife Linda Vanderwerf, more than anything I saw this week. with a record of 0-4, 7.40. Today begins Liam Hendriks' second attempt to secure a spot in the Minnesota starting rotation, which has been about as stable as a rockslide. There's a lazy line about a team that's buried in the standings, as the Twins are, that "they have nothing to play for." Those silly enough to believe that, believe everything that isn't the postseason is nothing, and that's not so. Even bad teams, and particularly the players on bad teams, have goals to reach for. One of the Twins goals is to find, develop and protect the pieces of a workable starting rotation for future seasons. The first group consists of Nick Blackburn and Scott Diamond. Blackburn is here not because he's earned it with his pitching, but because he has a guaranteed contract. Diamond has earned it with results; even in his loss Thursday night to Philadelphia, he wasn't all that bad (14 ground balls, three fly balls; 65 strikes, 35 balls). He just gave up a couple of homers, and got no run support. It happens. Diamond's ERA is now 2.13; double it, and you still have a reasonable starting pitcher. The second group is Hendriks, all by himself. Of all the starting pitchers in the Twins system, he's the most ready for a major league job. Not necessarily the best prospect of the bunch — I'd still prefer Kyle Gibson's pending career to Hendriks' — but the most ready to step in now. The third group is everybody else; flawed with possibilities. Carl Pavano and Francisco Liriano are pending free agency; Gibson and Alex Wimmers are rehabbing injuries; Scott Baker is both; Cole DeVries and P.J. Walters are limited by their stuff. Over the coming weeks/months, Hendriks will either rise into the first level or sink to the third. Jim Thome has hit 24 home runs in Target Field. Jim Thome DH'd against the Twins in all three games of the just-completed three game series twixt the Twins and Phillies. The Twins kept him in the yard in one of those games; it was also the game the Twins won. After Thome's three-run shot Thursday off Scott Diamond, one of my co-workers asked why Thome was with the Phillies, who have limited use for a DH (and none after this month). Answer: Because the Phillies offered him a contract early in the offseason, and Thome figured the offers would be few and far between; because he and Charlie Manuel, the Phillies manager, go way back; because he figured Philadelphia gave him a good shot at the World Series title that still eludes him. But realistically, he and the Phils aren't a real good fit. They tried to use him some early on at first base; he wound up spending almost two months on the disabled list. He came off the DL in time for the interleague road games, which gives Manuel the chance to get him in the lineup, but once that's over (next week), about all he can do is pinch-hit. I don't know if there are any American League contenders who can carry a part-time designated hitter. Part-time because he's not David Ortiz; you can't just stick Thome in the lineup seven games a week. His history with the Twins suggests that his three-day run in the lineup in Minnesota this week is about as much as he can handle without a day or two on the bench. When he can hit, he's a threat, still. It's the "when" part that's the issue. 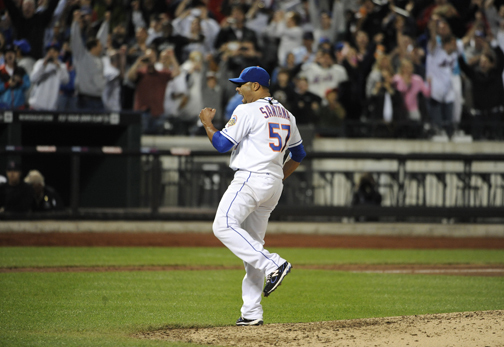 Johan Santana has made two starts since his no-hitter. He's pitched 10-plus innings and allowed 10 runs. It could have been worse' he left Thursday night's game having loaded the bases with no outs in the sixth. Another ex-Twins pitcher, Jon Rauch, bailed him out of that mess. A definitive line of cause-and-effect cannot be drawn here, but ... 134 pitches for the no-hitter, followed by two bad starts, even with extra days off. had a very great game. 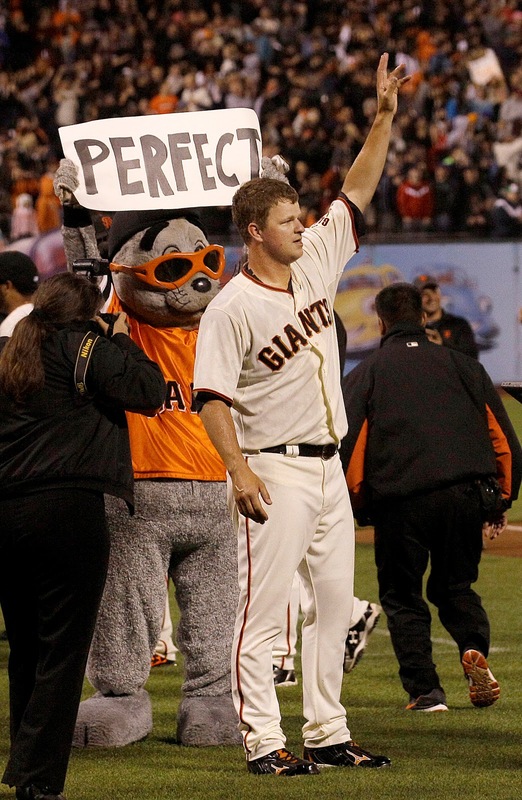 While I was sleeping (yes, despite all the middle-of-the-night time stamps on my posts, it does happen), Matt Cain of the San Francisco Giants threw a perfect game. It was one of the more dominant outings in baseball history, what with 14 strikeouts. That makes five perfect games since July 2009 -- less than 36 months -- and that's not counting the Amando Galarraga "imperfect" game marred by the Jim Joyce umpiring error. What I'm puzzling over -- and this will probably be my topic for the Monday print column -- is why do we suddenly have so many perfectos? Has something basic switched in the game, or is this just random happenstance? innings Wednesday, which raised his ERA to 5.40. P.J. 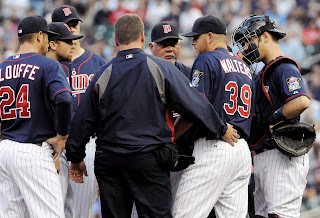 Walters gave up four hits on 15 pitches Wednesday evening, at which point Ron Gardenhire came out to check on him (and then pull him from the game). Cory Provus said on the radio broadcast that Walters' fastball was short of its usual velocity -- and his usual velocity is not all that fast -- and Dan Gladden suggested that Walters has been dealing with shoulder issues in his two previous starts. The Twins quickly announced that Walters would have an MRI exam on his shoulder today, an indication that this may not be a minor issue. After the game, Gardenhire said Lester Oliveros was being recalled from Triple A, with a corresponding move to be made after they get a diagnosis on Walters. Also coming soon is a move to recall Liam Hendriks from Rochester to make Saturday's start, so a second roster slot needs to be opened. The Twins have another off day on Monday, so they could skip Walters' rotation slot for the next turn through. My guess: They'll put Walters on the disabled list and send Jeff Manship back to Rochester this week. Who will take Walters' place in the rotation next week? Carl Pavano is eligible to come off the DL on June 19, but as of Tuesday hadn't thrown a ball since his last start; he's not an immediate solution. Cole DeVries might get another call-up. Or Brian Duensing, who has been much improved against righties this season out of the bullpen, could be called on to start. Or perhaps my Manship-to-the-minors notion was premature, and he'll get the ball the next time they need a fifth starter. But in that case, somebody else has to come off the active roster. Addendum: Seth Stohs offers a detailed breakdown of the projected Twins and Rochester rotations here. His conclusion on the Twins rotation: They'll go with four starters for a while (Diamond, Liriano, Hendriks and Blackburn) and turn to Manship to fill the fifth starter gap when that becomes necessary. It make sense. But there's still that nagging issue of how to get both Hendriks and Oliveros on the 25-man roster, one made all the more difficult by the desire to stay at 12 pitchers heading into the interleague road games (and no DH). Byron Buxton, the No. 2 overall pick in the amateur draft last week, had his physical Tuesday and took batting practice. Today, so we are told, he and the Twins will complete his contract, and then he'll head off to Fort Myers to begin the process of turning tools into skills. According to Jim Callis of Baseball America, Buxton will get $6 million, which is $200,000 under the slot value but 25 percent more than No. 1 pick Carlos Correa got from Houston. Buxton becomes the 16th player in draft history to earn a bonus of $6 million or more. 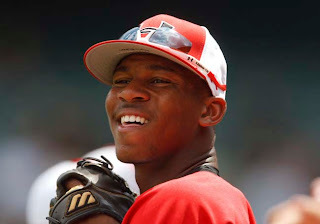 He matches Eric Hosmer (Royals, 2008) as the recipient of the largest straight bonus (not spread over multiple years under provisions for two-sport athletes) ever given to a high school position player. So Buxton got less than slot, but it's still significant money. I wonder what he would have gotten under the old system. Callis said on Twitter that he expects "several" teams to exceed their caps by up to 5 percent — a level at which they will be taxed 75 percent on the overage. I doubt the Twins will be one of them. Eddie Rosario, a primo prospect playing for Beloit, was hit in the face Tuesday by a line drive during batting practice and has at least one facial fracture. Perhaps Trevor Plouffe is the anti-Samson. On May 13 — Mother's Day — the former first-round pick and former shortstop went 1-for-3, which raised his batting average to .140. After the game, teammate (and fellow 2004 draftee) Anthony Swarzak sheared off Plouffe's flowing mane of hair for Locks of Love. Since then, Plouffe has hit eight homers and four doubles -- a slash line of .278/.307/.667. That's not much of an OBP, but that slugging percentage is quite impressive. For the season he stands today at .217/.299/.473. His offense, in short, has been all power. But that's more than Danny Valencia was contributing, and the sharp improvement in Plouffe's walk/strikeout rate suggests that, if anything, his batting average and on-base percentages are flukishly low. In 2011, in 320 plate appearances, Plouffe drew 25 walks and struck out 71 times; this year, in 144 PAs, 15 walks and 28 strikeouts. Valencia was shipped down to Rochester about a month ago, and Plouffe has gotten most of his playing time at third base since. Jamey Carroll's played there some also, and Plouffe's had starts in the outfield and at first base as well, but he's taking a grip on the third base job. And Plouffe has been better there than I could have imagined. He's made some errors, but he's also turned some double plays, and the defensive metrics I keep tabs on peg him as a slightly below average defender -- nowhere near the disaster that he was at shortstop. 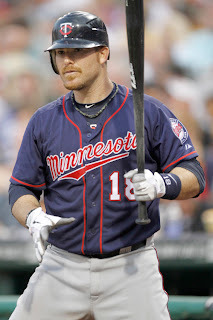 A month ago, I didn't think Plouffe could last much longer in the majors. Today, he's looking pretty good. At least if you don't mind the haircut. 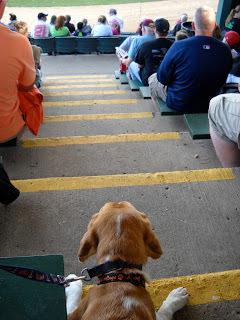 Last month I made a trip to Beloit and Cedar Rapids and pretended to be a scout in some posts and a column. Today I wish to call your attention to this post from John Sickels in his minorleagueball.com blog, which is a fixture in my siderail. Sickels watched the Snappers for a pair of games last weekend and comments more thoroughly (and expertly) than I did. to18 of the 24 Cubs he faced Sunday. Francisco Liriano didn't have a very good line at the end of his outing Sunday — four earned runs in 5.2 innings — but he probably deserved better statistically than he got. So it's two good-to-outstanding starts since his return to the rotation, one OK one. And they've all been against bad teams, so I'm still wary of jumping on the bandwagon, and I suspect the general managers with whom Terry Ryan will be talking trade in the coming weeks will be wary also. Which is fine. There's plenty of time between now and the trading deadline, and if Liriano is going to be worth trading, it will be after a sustained period of quality work. I see good and ill in baseball's new draft rules, but one thing the rules have done was speed up the signings. The Twins had 12 players inked by Sunday, and Bryon Buxton, their first-rounder (No. 2 overall) was to arrive in the Twin Cities today for his physical. I rather expect that the Buxton signing will come Tuesday, and he'll get to take some batting practice in Target Field before reporting to Fort Myers to begin his professional career with the Twins' Gulf Coast League team. 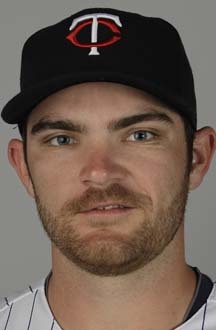 Liam Hendriks is apparently to be recalled to make the start on Saturday, the next time the Twins need a fifth starter. I said a while back that I expected Hendriks wouldn't be recalled until the team expected him to stick. If so, recalling Hendriks now suggests to me that it's going to be a while before Carl Pavano comes off the disabled list. As a self-described "Strat nerd" — at least a sporadic one — I had to take note of the two Minnesotans who last week went for the Guinness world record for consecutive hours playing a board game. Their game was Strat-O-Matic baseball, and they topped 61 hours when they finally called it quits Sunday. Believe it or not, they're both married. The joys of summer. Just a happy looking image. Pittsburgh is off to a pretty good start — 31-27, one game out of first place in the NL Central — even though it has scored 20 fewer runs than anybody in baseball. As I recall, the Pirates were doing well last season into July, and then things fell apart on them. I'm rooting for them; it's a great ballpark, and it's been too long since they've had any success. After his start of May 27, P.J. Walters had an ERA of 2.96 after four starts, and at least one metro beat writer was calling him the Twins best starter. Since then, he has allowed nine earned runs in 9.1 innings, and his ERA is 4.42. It's just six starts and a total of 36.2 innings, but his limitations as a major league starter are becoming more clearly visible. He's surrendered seven homers already, the result of mediocre stuff and occasionally flawed command. He's not Minnesota's best starter. He may not be the worst, either, but he's marginal. He's going to get more opportunities to establish himself in the rotation — but that says more about the alternatives on hand than about his talent or his future. Parmelee back, DeVries down: On Monday Cole DeVries "earned" his first major league win (five innings, five runs, four earned). On Thursday he was sent back to Rochester, with Chris Parmelee recalled. This is in no small part a function of the schedule; the Twins won't need a fifth starter until June 16, what with days off on Thursday and Monday. The Twins still have eight bullpen arms on hand, which is more than they should need, but ... two of the three starts against Kansas City (the two wins) were only five innings. Parmelee has been raking in Rochester of late. It will be interesting to see how, or if, he gets used. His playing time was rather slim for a while before his demotion. At the start of the year, he took PT away from Ben Revere; will that happen again? As for DeVries: He remains on the 40-man roster, but I doubt he'll return to the fifth starter role when the need arises. The Twins won two of his three starts, but that had less to do with how well he pitched than how much the lineup hit. Blackburn replaces Pavano in the rotation: FSN was praising Nick Blackburn for his "gritty" start Wednesday. I was irritated then, and then again when watching the rebroadcast Thursday noon. He faced 22 hitters and threw a first-pitch strike to eight of them. He threw 92 pitches, just 51 of them strikes. If the Royals had a lineup capable of taking walks and working the count, he'd have gotten hammered. But the Twins are stuck with him. Unlike the injured Carl Pavano and Scott Baker, and the suddenly resurgent Francisco Liriano, Blackburn is under contract for 2013, and I can't imagine anybody taking him off the Twins' hands. Liriano has second strong start: Francisco Liriano had the best start of the Kansas City series, and he lost 1-0. I said after he beat Oakland that shutting down the A's didn't establish that he's back; I'll remain skeptical after the Kansas City game. The Royals are a good lineup for him to face: a lot of left-handed hitters, very limited strike-zone judgment. 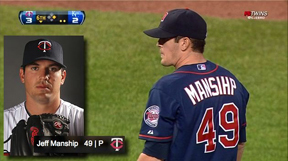 The magic of the "m": The Twins have been wearing the old "m" cap since Memorial Day, and the relic of the World Series teams may not be returned to mothballs for some time. Superstition is commonplace in baseball, but I'm more inclined to credit the Twins' 7-2 record with the cap to a soft schedule than to the lucky lids. The Twins had 43 picks in the 40 rounds of the 2012 amateur draft. They took, according to Jordan Garretson of mlb.com, 30 collegians and 13 high schoolers -- 24 pitchers, nine outfielders, six catchers and just four infielders. They probably won't actually sign half of those selections. We can expect that they will sign all 13 selected in the first 10 rounds, because any of those picks unsigned represent dead money. They'll ink maybe a half-dozen of the others. The consensus on minorleagueball.com Wednesday morning was that Minnesota won't come close to spending its MLB-high bonus allotment. Perhaps. Taking a quick gander at the final day's crop of picks as they flowed over the mlb.com feed, I noticed some high schoolers with scouting reports attached -- a definite minority in the late rounds. They were guys with tough college commitments -- James Marvel, in the 37th round, for example. The report speaks highly of three pitches, of his "pitchability" (meaning he uses the stuff well) and of projection (his body is not yet mature). Baseball America rated him as the 206th prospect in the field, so he theoretically could have gone in the sixth or seventh round. Marvel also has a Duke scholarship. The Twins may not lure him away from Duke, but a bonus surplus won't hurt in that effort. In fact, it's probably essential; whatever his price is, it's probably more than sixth or seventh round money. In addition, according to Baseball America, for this year only a bonus surplus can be carried over to next year's draft. This was regarded as a notably thin field; 2013 is probably going to be deeper. It's not a terrible thing to carry over a surplus. 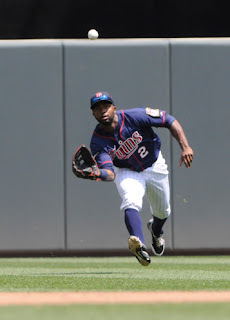 As for what the Twins did: They took the consensus top talent in Bryon Buxton. They went heavily for pitchers with velocity, with an emphasis on college relievers and with an apparent intent to try at least some of them as starters. People throw hard in relief than they do as starters. Note Glen Perkins, for example. So the impressive velocities reported for some of these picks figure to decline as starters. College starters typically start once a week. Pro starters start every five days. That heavier workload tends to sap velocities. It's pretty common for minor leaguers to fail to live up to their amateur radar gun readings. A lot of top-grade college starters run up big pitch counts -- which may be a reason so many sustain significant arm injuries early in their pro careers. The Twins, by taking bullpen arms in the early rounds, were selecting pitchers who haven't been potentially overworked. On any level of baseball, relief pitchers are generally pitchers deemed too flawed in some way to start. There are reasons the pitchers the Twins took weren't starters. Maybe they were't good reasons, but there were reasons. It only takes the Twins being right on one or two of them to make this a successful approach. In the final paragraph of this morning's post, I noted a report that Mark Appel had turned down a pre-draft offer of $6 million. The reporter who stated that has since retracted it. I'm not privy to the specifics of the pre-draft contact between team and player. The behavior of the two parties makes the initial report credible. It may indeed be that the Astros never specifically offered $6 million, but there shouldn't be much doubt that Appel's financial expectations outshot the willingness of anybody to meet those expectations, and that's why the player generally projected to be the No. 1 overall pick fell to No. 8. And the player's refusal to talk to the Pittsburgh media after his selection, instead issuing a statement on his dedication to reaching his academic goals, comes off as petulant. He ain't getting what he thought he was going to get. Baseball's amateur draft ground through round 15 Tuesday afternoon. There are still 25 rounds to go, and these rounds are, at least in theory, increasingly irrelevant. The major talent has been plucked already. But there was some interesting gamesmanship going on Tuesday — and, as an unintended consequence of the new draft rules the commissioner's office insisted on in the new labor agreement, the drafting of many players in Rounds 6-10 who will be released in spring training 2012. Every pick in the first 10 rounds was assigned a dollar value. Each team was then assigned a "bonus pool" — the sum of the values of those picks. Teams can go under their budget without consequence, but the penalties for exceeding the total pool are heavy, and they get heavier quickly the more the team goes over its allotted sum. The value of an unsigned pick is deducted from the team's pool, so it can't just give its first round pick the money allotted to the 10th round and tell that choice tough luck. After the 10th round, all picks are budgeted for a maximum of $100,000, and there are no penalties for not signing a pick. Any bonus in Rounds 11-40 in excess of $100,000 counts against the bonus pool. What happened Tuesday, particularly in Round 6 through 10, was intentional overdrafting of players. Baseball America tweeted that they were receiving text messages from scouts after picks saying: I didn't even turn in a report on this guy. Players who in the past would have been selected 20 rounds later -- and perhaps not even signed -- were being picked to build a cushion for the harder signs. The idea: A team would contact a player, often a college senior, who figured to go late in the draft if at all. Say the slot was valued at $700,000; the team tells the player: We'll take you IF you'll sign for $150,000. The player, realizing that that's more than he'd get if drafted where he ought to be taken, grabs the opportunity — and the team has an extra $550,000 in its bonus pool, which it can spend on a tougher sign either earlier in the draft or later. Some high school players who were seen as tough signs went undrafted until after the 10th round penalties. Others were taken in slots whose values were not sufficient to buy them out of their college options. Saving money on the other picks becomes essential to sign the prime talent without exceeding the budget. But the result is that Rounds 6-10 mean less than they did last year. A lot of non-prospects got taken in those rounds, and more realistic prospects deferred to later rounds. The best prospects — with a few exceptions, most notably Mark Appel — will still get their money, and some weak ones are going to benefit as well. The savings are coming out of the midrange prospects. Appel, widely projected to be the first overall pick, was reportedly offered $6 million by the Astros before the draft and turned it down. (The first pick was slotted for $7.2 million.) He wound up the eighth overall pick, by the Pirates, and their total bonus pool was $6.6 million. He has no chance of getting what he expected. He touched 90 mph at times in high school but has filled out physically and become a true power relief arm in his college career. He emerged as a prospect with 10 strikeouts in 4 1/3 innings against Louisiana State as a sophomore and threw plenty of strikes in the Cape Cod League last summer, posting a 22-2 strikeout-walk ratio in 19 innings. The Blue Demons have used him as a starter at times, including a heavily scouted outing May 4 against Central Arkansas. His high-effort delivery wore him out after four innings and he got only one out in the fifth, but he sat at 94-96 mph with his fastball for three innings, typical of his velocity at his best. The Cape Cod League's Brewster Whitecaps recruited him primarily as a hitter but wound up needing him on the mound and he blossomed as a closer, saving seven games and allowing one earned run in 17 appearances. His fastball usually operates from 93-95 mph and reaches 98 with some armside run and sink, though it dips to 90-92 when he works on consecutive days. His hard curveball creeps into the low 80s and grades as a plus pitch at times. Despite demonstrating some feel for a changeup in bullpen sessions, the 6-foot-3, 200-pounder profiles strictly as a reliever. Scouts don't like his arm action or the effort in his delivery, which limits him to average command and fringy control. They're both seen as bullpen guys, at least by Baseball America. Still no Mitch Brown. Makes me wonder if signability is an issue. Having taken a high school outfielder with the second overall pick, the Twins turned to pitchers with their two supplemental picks Monday. J.O. Berrios, a high school right-hander from Puerto Rico, was 49th on Baseball America's list, but the Twins clearly ranked him higher than that on their board. They took him with the 32nd pick. Berrios worked with a conditioning coach this fall and spring and added 20-25 pounds to his frame since the summer and now has a muscular, athletic 6-foot-1, 180-pound physique. The added muscle has allowed him to smooth things out and has boosted his fastball velocity. His fastball now sits in the 93-95 mph range and some scouts have seen him touch 98. He throws his fastball down in the zone, mixes in a sharp, 80-81 mph slider and shows the makings of a solid changeup with fading action. Six-one is short for a RHP, and he's not what scouts call "projectable" — meaning that there's not much chance that he's going to develop further physically. But the fastball's there, the breaking ball is good, and he might move faster through the system than most teens would. Luke Bard, college righty from Georgia Tech, went with the 42nd pick. He's the brother of Boston's Daniel Bard, a power pitcher who did well as a set up man last year and struggled this season as a starter. Luke Bard relies on a power sinker and hard slider and is seen by Baseball America as a likely bullpen arm. Bard is No. 93 on the BA list, and he missed much of this season with a torn lat muscle. This pick reminds me of the selection in 2008 of Carlos Guterriez, who was, like Bard, a college reliever who relies on a heavy sinker. The Twins took Guterriez late in the first round and used him as a starter in the minors for a few years, partly to get him innings and partly in hopes that he'd master some secondary pitches and be a starting option. That didn't take. Guterriez is now relegated to the bullpen, and he's had some injury issues the past two years. He's appeared in just five games this season for Rochester. The Twins will apparently try the same approach with Bard -- use him as a starter and see if he sticks in the rotation. 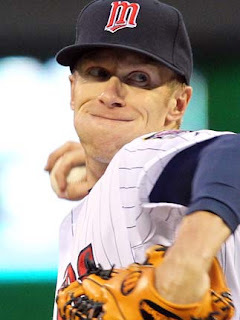 Missing from Monday's draft list, of course, is Mitch Brown, the Rochester Century pitcher who has drawn obvious interest from the Twins (Terry Ryan has been seen at several of his starts, including one last weekend). Brown, listed at No. 44 by Baseball America, didn't go in the first 60 picks, and remains available as the second round awaits today. The Twins have the third pick in the second round, and I will be surprised if they don't use it on Brown. But then, I was surprised they didn't use one of their supplemental picks on him. Byron Buxton during a showcase game last summer. I am acutely aware of the limitations of my knowledge of amateur prospects. I'm not a scout, so I have no first-hand observations of Bryon Buxton or Carlos Correa or Mark Appel to rely on. Unlike John Sickels or the crew at Baseball America, I don't talk to scouts or scouting directors, so I don't have second-hand information. I can offer nothing more than third-hand opinions. That the Twins passed on Appel didn't disturb me at all (it apparently does Joe Christensen, who tweeted repeatedly in the wake of the pick that the Twins have zero top-of-the-rotation prospects). My reading of the information on Appel (and the other top collegiate pitchers) does not suggest that any of them are destined to be the next Justin Verlander. That Appel fell to eighth suggests another issue: He is a Scott Boras client, and Boras has been known to hold inflated bonus expectations. Buxton was said by the Twins to have been at the top of their draft board since last summer, but Appel's chances of being their pick may have died the night Boras sat in Terry Ryan's suite last month. The draft rules have changed sharply from the recent past, and the penalties for overpaying to sign propects are steep enough that it's hard to imagine anybody exceeding their alloted budget. And the penalty for not signing a pick is also painful. Appel and Boras, I think, overplayed their hand leading up to the draft. The pitcher was taken by a team (Pittsburgh) whose TOTAL budget -- for 10 rounds -- is less than the money slotted for the first or second overall pick. Somebody is going to come out of those negotiations unhappy. Jim Callis of Baseball America's Mock Draft 4.0 kept the status quo for the top two picks: Still Mark Appel to the Astros, Bryon Buxton to the Twins. Jonathan Mayo of MLB.com has the same top two in his draft day mock, Appel first, Buxton second. BA has revised its top 50 draft prospects list. Buxton is still on top, but Carlos Correa is now No.2. It had been Mike Zunino second; he's dropped to No. 4, with Appel third. The Astros are telling people they have five players they're trying to decide among; this is seen as a negotiation ploy, intended to entice Appel to accept less than the designated No.1 slot money (but more than he'd get if he slips to No. 2 or lower). Tonight will be the first 60 picks -- first round and supplemental first round. The Twins have three selections in those rounds -- No. 2, 32 and 42. There's a widespread expectation that one of those latter two pick will be used on Mitch Brown, right-handed pitcher from Rochester Century. He's No. 44 on the BA top 50 rankings. First pick gets thrown out a bit after 6 p.m. our time. Draft will be broadcast on MLB TV. MLB's annual draft of American and Canadian amateur talent begins this evening, and the Twins have the second pick (Houston picks first). I regard Baseball America as the best and most plugged-in guide to the scouting consensus, and its ranking of the draft field has Byron Buxton, high school outfielder from Georgia, as the best available talent, followed by Mike Zunino, a catcher from the University of Florida. They are followed by three college RHP (Mark Appel of Stanford, Kevin Glausman of LSU and Kyle Zimmer of San Francisco), then Carlos Correa, a high school shortstop out of Puerto Rico. On Sunday morning I heard Deron Johnson, the Twins scouting director, interviewed on the radio pre-game show, and Johnson said there were three names the team has in mind for that No. 2 pick. My assumption is that the three are Buxton, Appel and Correa, and I suspect (and, to the limited extent that I will allow myself to have an option on players I've never seen and whose statistical record is limited) hope that Correa is ahead of Appel. MinorLeagueBall.com offers two versions: John Sickels and Matt Garrioch, and they agree on the first two picks -- Appel to Houston, Buxton to the Twins; it also held a "community" draft, in which the particpants had Houston taking Buxton and the Twins Correa. Jonathan Mayo of MLB.com: Houston takes Appel, Minnesota Buxton. MyMLBdraft.com turns it around: the Astros take Buxton, the Twins Appel. Bleacher Report: Houston takes Appel, Minnesota Buxton. There's a bit of consensus there, right? Pretty much everybody expects Houston to take a college pitcher, and pretty much everybody expects the Twins to take the consensus "top talent". Whether Buxton really is the top talent is another matter. Sickels, for one, puts Correa at the top of his list. It's entirely possible that the Twins see it the same way. One more photo from Johan Santana's no-hitter; one more pun of the rhyme of the word "no" and the first syllable of his first name. There have been three no-hitters so far in 2012. One (Jared Weaver) came against the Twins. The other two were thrown by former Twins who were traded for each other (Santana and Phillip Humber). Free Press colleague Pat Christman and I were looking at photos from Johan Santana's no-hitter, and we came across this sequence of a Santana pitch. It's actually from a different game, but still ... it reminded us of the old flip book animation, and we decided to try it in Blogger. Tom Seaver and Dwight Gooden. During Johan Santana's Twins years, I frequently pondered this question on my way to work on days he was to pitch: What am I going to do if he makes some history tonight? On Friday night, Santana finally threw the no-hitter I anticipated on so many nights. He did it, of course, for the Mets, but for a lot of Twins fans in Minnesota, he'll always be one of our guys. He is having a superb season. This is actually his second straight complete-game shutout. He's struck out 68 men in 68 innings — even with a diminished fastball, he still misses bats — and his ERA is 2.38. Not bad for a guy whose very career appears in jeopardy a year ago. I only hope that Friday's feat won't prove damaging. Santana threw 134 pitches (77 strikes) for his no-hitter. His career high had been 125. He missed all of 2011 with a complex shoulder surgery, and has had other significant surgeries. While he keeps himself in superb physical condition, he's not a workhorse. Obviously it was a risk Santana was willing to take for a shot at history. Only time will tell if it was a wise risk to take. would rank second on the Twins staff. Jamie Moyer had a 2-5 record and a 5.70 ERA when the Colorado Rockies decided that they could find more profitable ways to invest the roster spot, rotation berth and innings. Denver is not a hospitable home for any pitcher, much less a 49-year-old who had difficulty breaking 80 mph with his best fastball. 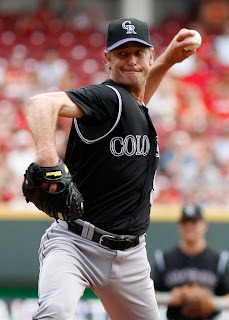 Moyer allowed 11 homers in 53.2 innings for the Rockies, which is a lot. Too many, even in the thin air. Still, Moyer struck out 36 men — 6.0 per nine innings, a rate consistent with what he's done over the course of his long career. He might still be, in the right environment, a useful back-of-the-rotation arm. The news Wednesday that Moyer had been designated for assignment by the Rockies led to immediate Twitter speculation by some Twins bloggers about whether he and Minnesota would be a fit. I can't see it. Yes, Target Field is more forgiving than Coors Field, but Moyer would also be returning to the DH league, with its deeper lineups. More to the point, who would he displace from the rotation? The Twins have, at the moment, two pricey veterans (Carl Pavano and Francisco Liriano) and three minimum wage guys (Scott Diamond, P.J. Walters and Cole DeVries), with another veteran (Nick Blackburn) nearly ready to return from the disabled list. Pavano, Liriano and Blackburn aren't going anywhere, and Diamond and Walters shouldn't. If Moyer gets to extend his career, it should be for a team in the National League that needs to win now and needs to fill a gap at the end of the rotation. 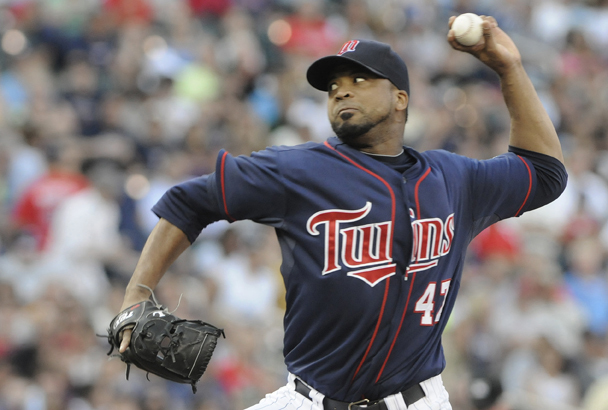 The Twins are in the American League, rebuilding, with gaps at the front of the rotation. That said, I must admit that I would be far more likely to make the trip to Minnesapolis to watch Moyer work than to see Blackburn.